Climbing and access information for this peak is found on page 335. Below you will find extensive updates. The first section is by Mike Hays and the second update is for a new route up the peaks West Shoulder/Northwest Ridge by Livingston Douglas. His ascent is the first recorded ascent via that line. anchors the southwest corner of the Henry’s Lake Mountains on the Idaho/Montana border a few miles west of Yellowstone National Park. The mountain is situated on the Continental Divide and abruptly rises 3,765 feet above Henry’s Lake. 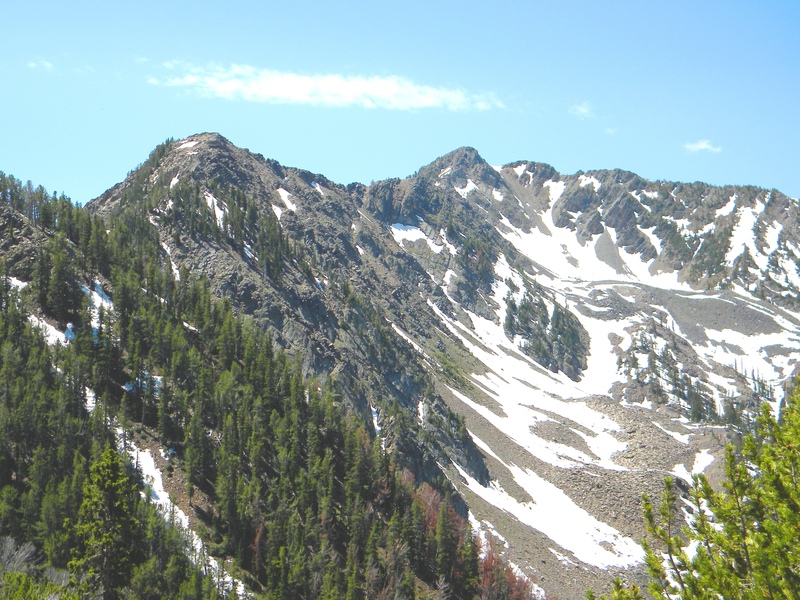 It is the fourth tallest summit in the small, but beautiful, Henry’s Lake Mountains. 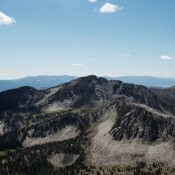 Black Mountain from Targhee Peak. The mountain is a general pyramid with three close summit points. The main ridges run northwest, southeast, and northeast. The northerly ridges are part of the Continental Divide. The south aspect is broad and steep with some relatively small, yet sharp and steep, ravines. This south slope is covered with tangled shrubs and trees on very rotten rock. Various maps show two trails coming up this slope, but they likely are no longer in use or present. The northeast bowl is a series of shelves below steep slopes supporting large talus runs, subalpine forests, and marshes and ponds. The northwest bowl is very steep and holds substantial snow well into summer. The area can be entered via the Mile Creek Trail (004) from the Montana side, or from the Targhee Creek Trail (27) on the Idaho side. 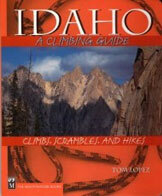 The Targhee National Forest does a great job of providing access and trail info from the Idaho side on the internet. However, the Beaverhead National Forest provides little information for the Montana side. Fortunately, we’ve captured the Montana access here for you. From the south on Highway 20, drive 42 miles north from Ashton, Idaho, to its junction with Highway 87. Turn left (west) on Highway 87 and drive 9.0 miles to the Idaho/Montana State line. Continue north on Highway 87 for approximately 3.6 more miles to the Mile Creek Road. This road is marked by a small sign that points toward the driveway of a large house close to the highway. Take the road as it immediately turns away from the house and heads for the mountains. From the Highway 87 turnoff, it’s approximately 1.0 mile to the trailhead. Cross a stream immediately before the trailhead. The stream bottom is hardened, so it should be no problem for most vehicles. If unsure, park west of the creek and cross on foot. The total distance from Highway 20 to the trailhead is almost 14 miles. To reach the trailhead from the north, take Highway 287 south from Ennis, Montana, for 40 miles, then turn right (south) on Highway 87 and go 5.0 miles south to the Mile Creek turnoff. (The same turnoff by the large house mentioned above.) If coming from the east, go 13 miles from West Yellowstone over Targhee Pass to the junction of Highway 20, as mentioned above. The Mile Creek Trail is not as indicated on recent USGS quad maps. After the first few miles, trail reconstruction includes a series of long switchbacks and the trail reaches the top of the Continental Divide further south than indicated on older quad maps. But the trail is obvious and there is no way to get lost, even on the old trail. From the trailhead, follow the path south up the Mile Creek basin for approximately 6.0 miles. Here, you junction with the Targhee Creek Trail (27) on the Continental Divide that separates the Targhee Creek and Mile Creek basins. Turn right on Trail 27 for a very short distance down to the north end of the gentle basins at the northeast foot of the peak. Once in this basin, follow the suggested path found in the Route Overview section. To reach the Targhee Creek Trailhead, travel 15 miles north of the Island Park Ranger Station on Highway 20 to Forest Road 57. The turnoff for FS-57 is about 10 miles west of West Yellowstone. Follow FS-57 a short distance to its end at the trailhead. The Targhee Creek Trail, with a 1.5 miles portion of the Continental Divide trail, makes a 15-mile loop through the heart of the Henry’s Lake Mountains. 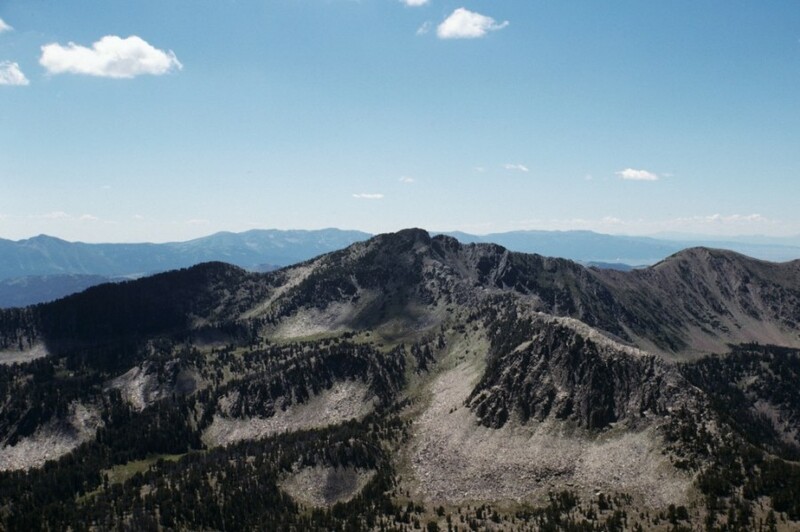 To reach Black Mountain, take the west branch of the loop into the Dry Fork drainage, then into the headwaters of the West Fork of Targhee Creek. It’s approximately 5-6 miles to the basin at the northeast foot of Black Mountain. Once in this basin, follow the suggested path found in the Route Overview section. This mountain is fairly crumbly and possesses often steep and difficult slopes. Still, it is a good scramble for people if they are careful and plan well. Climbing the mountain from the south would be very difficult because of a long, steep, slope composed of loose material covered by tangled shrubs and trees. The northwest ridge, or north bowl, are also options, but getting up to these areas from the Mile Creek Trail would be difficult. Also, the north bowl is made up of very steep suspect rock that is often locked in snow. The northeast ridge may look inviting on the map, but its very dangerous and would be very difficult. By far, the most practical and safe way to this summit is on the east or northeast aspects via the east base of the northeast running ridge. Once the northeast basin is reached from either the Montana or Idaho side, there is no particular route to follow. On the flats just below the Continental Divide, leave the trail and head south to southwest. Cross several small flats and basins. It is possible to travel on the talus immediately below the ridge, but hopping rocks takes time. Getting too far east and hiking the up and downs of the drainages also takes time. Pick your way, finding a happy medium to the large flat with a pond at the immediate southeast foot of the summit cone. From here, take a number of small runs through the solid rock and cliffs to the summit area. Or, continue south to the end of the flat and work around the subtle aspect change to the more east-facing slope. Then, take a less steep run up through stunted trees to the top. The footing with the former summit option is difficult due to scree and loose gravel and soil. The second route is easier, but may take a bit longer. A nice return from the summit would be to hike down the northwest ridge to the west ridge points that are also over 10,000 feet. Here, drop off for a long descent back to the Mile Creek Trail. Be sure to have a topo map to find easier, more open, gentle slopes and allow yourself plenty of time. From the northeast basin over the mountain and down into Mile Creek, there is no water except for snow, which may not be present late in the summer. Park at Raynolds Pass along ID-87 [(A)]. The elevation at Raynolds Pass is officially 6,836 feet. It is best to park on the east side of the pass on a minor jeep road, in order to avoid interfering with the tractor-trailers that often stop on either side of the pass in the gravel pullout areas to either rest or to test their brakes before continuing on their journey. This climb begins at Raynolds Pass, where ID-87 crosses the Continental Divide and descends into the State of Montana. This route differs from the standard route discussed in the book, which follows the Continental Divide from Raynolds Pass to the summit. This is a new route that is more direct and is easier than the standard route. It does not follow the Continental Divide until it reaches the Northwest Ridge at Point 10020, which is just north of Point 10099. From Raynolds Pass, bushwhack across the open sagebrush terrain, aiming directly east at a prominent, forested shoulder. This shoulder is directly south of the shoulder/ridge that the Continental Divide follows. An obvious gully separates these two shoulders. You will cross a dry gully en route to the base of the forested shoulder. Bash through a thick section of aspens and brush at the base of the shoulder to reach a moderately steep, open-forest slope. The shoulder is ill-defined here and is more of a face climb, but it goes quickly. The shoulder becomes well defined at about 8,100 feet. Scramble up the shoulder through easy open forest. Higher up, the shoulder becomes a mix of loose scree and krummholz. This is the hardest section to climb, but it doesn’t last for long. You will soon pop out on the Continental Divide at Point 10020, just another rocky bump on the Northwest Ridge of Black Mountain. From here, you get a good look southeast at the choppy, somewhat-intimidating ridge leading to the more-intimidating summit area of rugged Black Mountain. The climb has now morphed from a Class 2 endeavor into a tedious Class 3 outing. From Point 10020 (which has a nice cairn on it), follow the rocky ridge in a southerly direction down to a minor saddle, losing 75 feet in elevation in the process. Climb up over Point 10099 then continue southeast along the narrow, rocky ridge and drop 200 feet to another saddle. This saddle is elongated and narrow. It is a time-consuming mix of talus humps, rocky ridge outcrops, and small towers. But your perseverance will get you to the southeast end of this rather unpleasant “saddle”. From here, scramble up the final 350 feet of the ridge on much more enjoyable Class 3 rock to reach the small, rocky perch that is the summit of Black Mountain. In my opinion, Black Mountain is the most beautiful of the Henrys Lake Mountains. Its ruggedness is impressive. It’s unlikely that you’ll encounter any other humans up here, though you may find a hawk or falcon riding the air currents swirling around the peak. The summit offers a wonderful aerial view of Henrys Lake. View 7.5 minute Topographical Map in a new window.